Rock climbing can be comfortable in the Philippines' biggest indoor air-conditioned sport climbing venue. Advanced climbing safety systems make it easy for beginners to pick up climbing, which is perfect for groups looking for an afternoon of activity together. Enjoy an indoor games day! This is a two hour programme with a team game incorporated into your introductory climbing experience. Ideal for those who want both light-hearted games and some serious learning points! Your team will experience a series of challenges specially designed to build communication, trust and creative problem-solving abilities. Programme runs for three hours with activities suitable also for non-climbing participants. Get to know your colleagues better with climbing games suitable for the young and young-at-heart. Programme runs for two hours with a focus on fun and interaction! 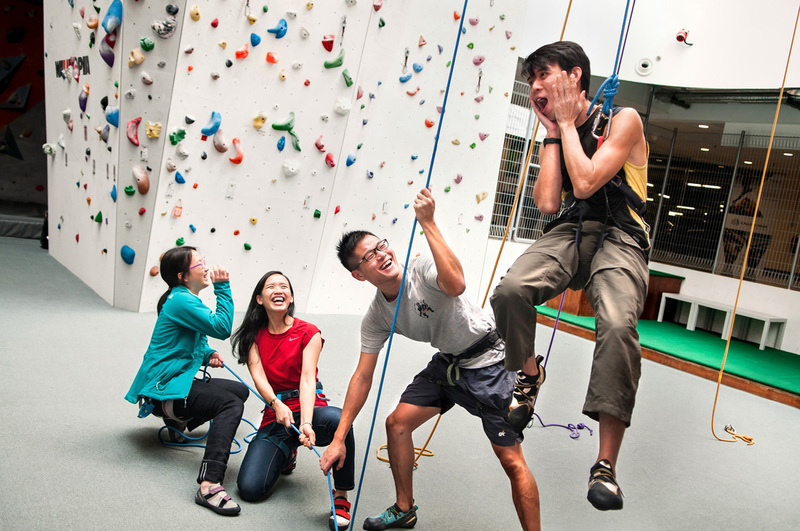 Fees are a nett price that includes day entry to the facility, exclusive use of selected climbing areas, rental of climbing equipment and the guidance of climbing instructors. All programmes require a minimum of 8 persons to start and quote may vary depending on group size and timing. Contact us early as timings are subject to availability! To confirm your booking, we would require payment of a 50% non-refundable deposit at least 1 week in advance. For groups of 20 participants and above, please make payment at least 2 weeks in advance.